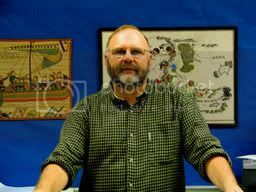 For the last three and a half years, award-winning music journalist Tom Moon has been searching out peak musical experiences from all genres and every corner of the earth. 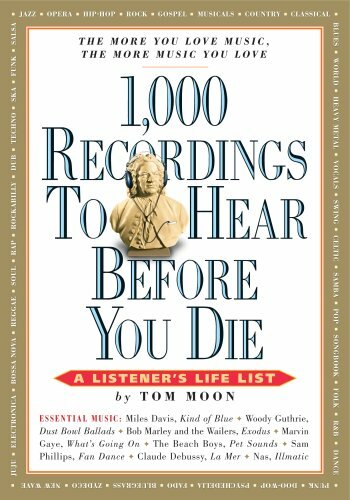 1000 Recordings To Hear Before You Die, published by Workman Publishing in August 2008, is the result of his journey. California Dreamin (The Mamas and The Papas): This song takes me way back to my teen years.. I had a teen penpal gal in California and loved listening to the song and thinking about her. Good Vibrations (The Beach Boys): This song is more representative of surfin' music than anything.. brings back memories of high school (NY) pizza after basketball games at Gene's pizza. How Great Thou Art (Elvis): The soulful side of Mr Presley comes though clearly in this song. I guess I include this one because I like his voice and and this is one of my favorite hymns. The Sound of Music (Rogers and Hammerstein): The music helped to bring the story of the Von Trapp family to life. Climb Every Mountain is one of the most inspirational songs ever written. A Hard Day's Night (Beatles): Six Beatles' albums made Moon's list. While I liked their later recordings I always will remember the Beatles in their early years and how original and exciting they were. At Folsom Prison (Johnny Cash): I love listening to Johnny.. his style and voice transcend country music. I think that he had a gift that gave him the ability to connect with his listeners. Peter, Paul and Mary: I loved so many of their songs.. Leavin on a Jet Plane was a classic.. remembering it causes me to think of the thrill of my first plane ride when I was inducted into the Army. What are some of your favorites from Moon's list? I look forward to the day when I can make that road trip and share a cup of coffee with you Bill. We have more in common that I thought.... I would have picked these songs too. BTW those little cinnamon rolls from pie crust are soooooo good, wish I could send you some nice warm ones. Also, my husband saw your side bar that says "I'm BOB, deal with it!" I have to say - I like ALL these songs/albums! It was fun to read your memories of each one. Good Vibrations puts me right in the backseat of my best friends convertible Mustang driving down Coast Hwy. in the summer feeling so HAPPY and free! What a great idea! There are already lists of movies to see, books to read. I think I need to read that book and check my personal list. DJ Shadow and The Propellerheads. He sites one of Brian Eno's most influential works (though Eno has made a few other landmark albums over his career that make Ambient 1 a debatable choice.) There other selections he made that I haven't heard, and he's earned my confidence to go find them.